One of the more artistic gems ot the Metro Manila Film Festival (MMFF) 2017 is in danger of losing its already limited run. 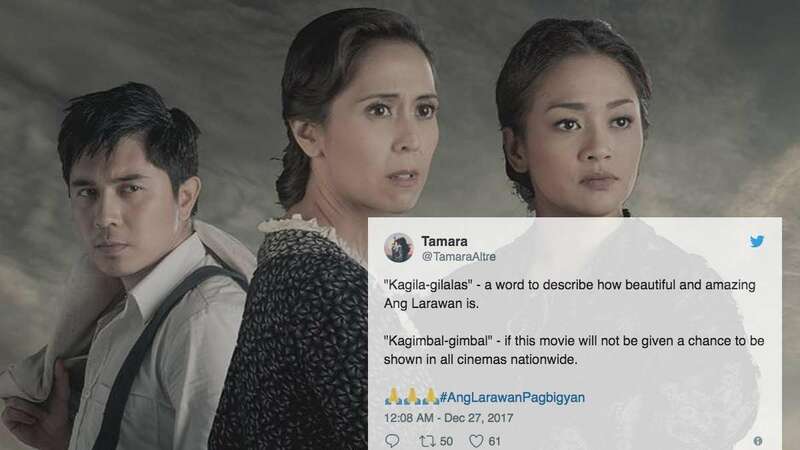 The gala's spokesperson Noel Ferrer revealed to DZMM that the producers of Ang Larawan spoke with mall owners after the MMFF's poor attendance on opening day. The two parties then decided to withdraw the musical film from some locations and just show it again on January 1. "Mayroon talaga extreme scenario na mismong mga producers ay makikita nila na, 'Ay, hindi namin market iyan.' Kaya ibinibigay na rin nila iyong mga theaters," he explained. Ang Larawan, based on the play A Portrait of the Artist as Filipino by National Artist for Literature Nick Joaquin, stars Joanna Ampil, Rachel Alejandro, and Paulo Avelino, among others. Set in pre-World War II Manila, the Asian Future Film nominee (30th Tokyo International Film Festival) is also somewhat a collaborative effort between the late Rolando Tinio (lyrics) and Ryan Cayabyab (music), which makes it an instant classic.